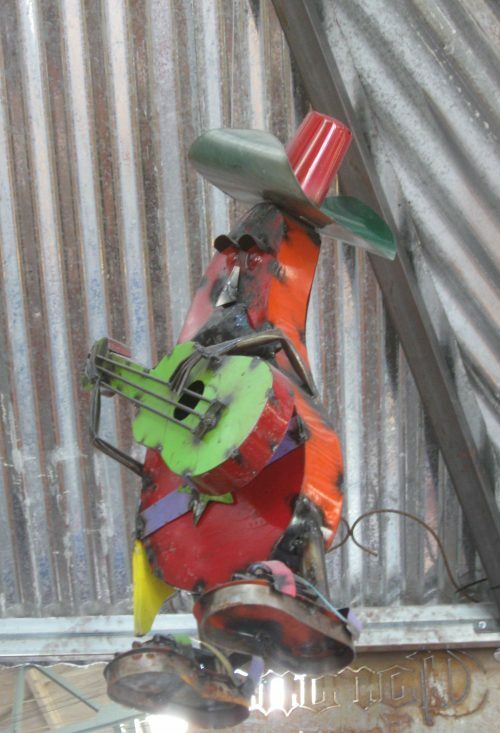 Mexican Painted Scrap Metal Sculptures: Recycled, Rustic. 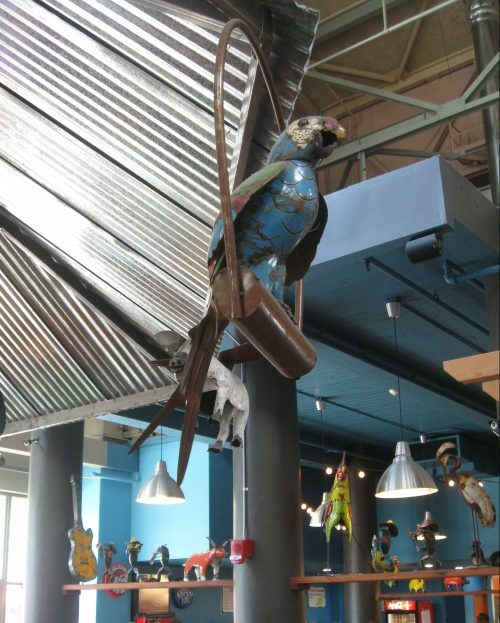 Parrot; plus a view of the cafe interior, where similar figures are featured. 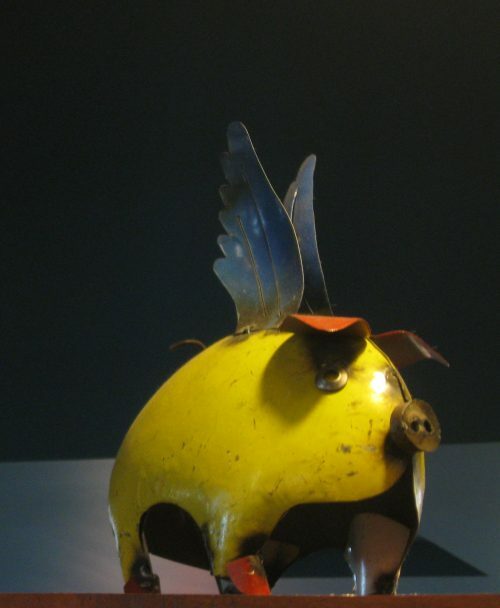 I’ve created quite a few blog stories about Mexican art and culture. I grew up in Yakima, WA; many of the kids I played with were of Mexican descent. In my late teens, I played music all over the Yakima Valley, for and with my Latino brothers and sisters. 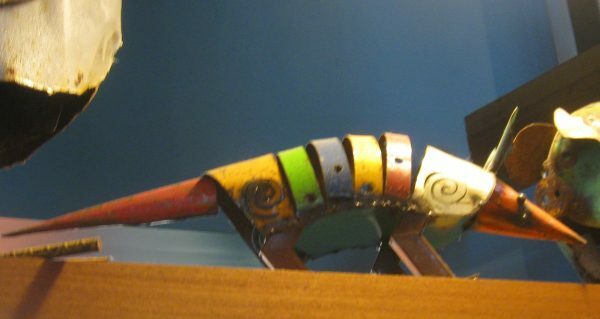 When I reached adulthood, I began collecting Mexican art, with a mad passion. Sadly to say, the fabulous objects pictured here are not found in my collection. 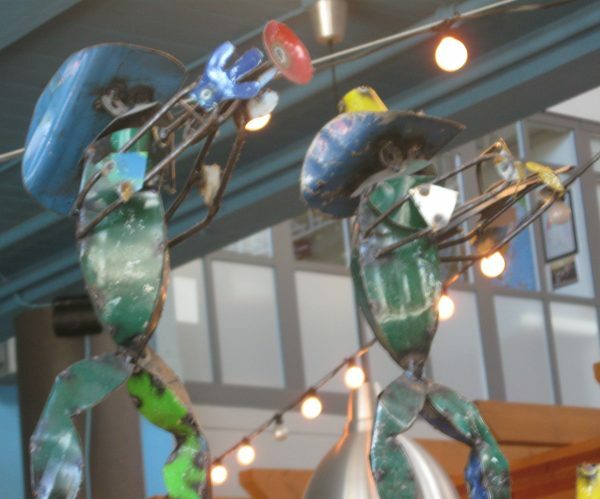 I spied them gracing the walls, ceiling and shelves of a Seattle Mexican cafe, Blue Water Taco, located in our amazing Seattle Center (stop in and see them in person, in the Armory). Can be done with tin snips. And yes, this is from my collection. 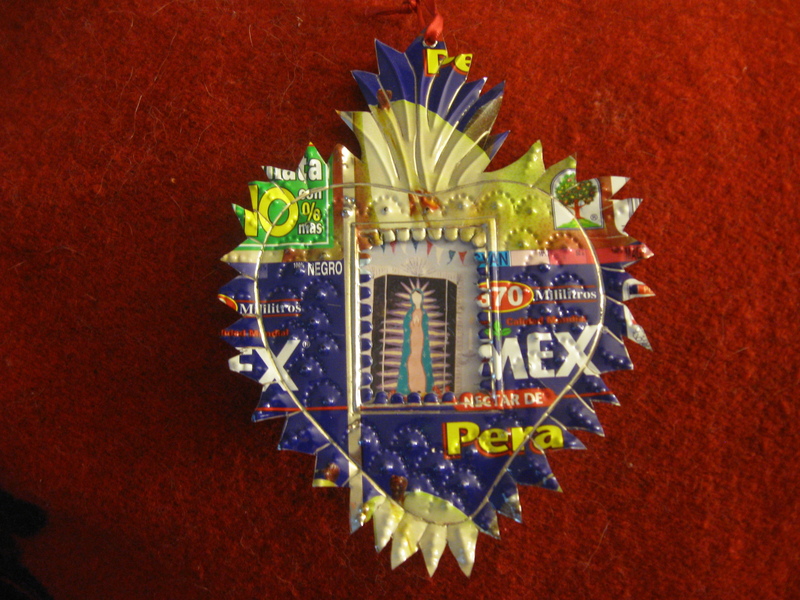 This is Mexican tin art. When I initially decided to write a story about the wonderful, ingeniously-envisioned and crafted figures here, I used the term, “Mexican tin art sculptures”. 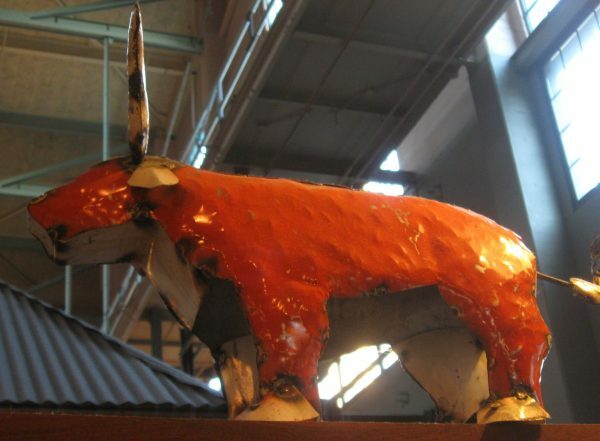 No: this is metal art, not tin art. 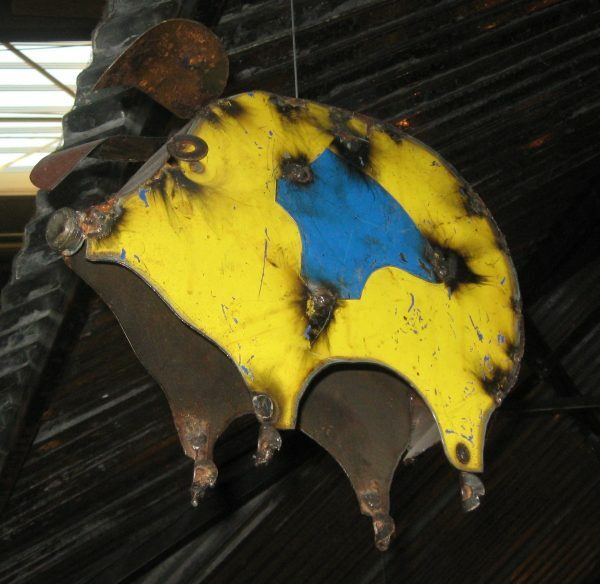 This is recycled steel. Heavy, sturdy material. 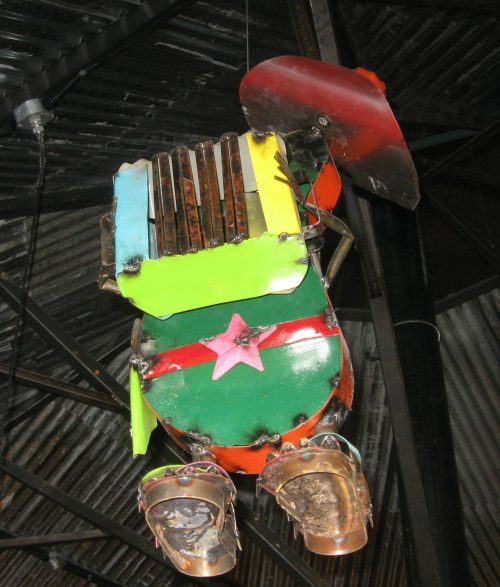 The correct term for this art is painted scrap metal sculpture. Sometimes it’s simply known as yard art, because lots of folks enjoy displaying it in an outdoor setting. But these whimsical creations look great when displayed indoors, as seen here. I’ve found that a lot of the folk art I post about is new to many of my readers, so I strive to provide as much information as possible. However, in spite of a lengthy search of the www, I couldn’t find even one artist’s bio for this post. I know these are made in Mexico (and probably in the U.S. by Mexican-Americans), by skilled, crafty people, who can literally make come to life, any animal/bird/figure they decide to create. But that’s about all I know. I also could find no information on how these sculptures are created. Where does the metal come from? What tools are used? Are these mainly made in one region of Mexico? Sadly, I don’t have the answer to any of these questions. I hope you’ll simply enjoy them for what they are: unique, handcrafted, rustic beauties. 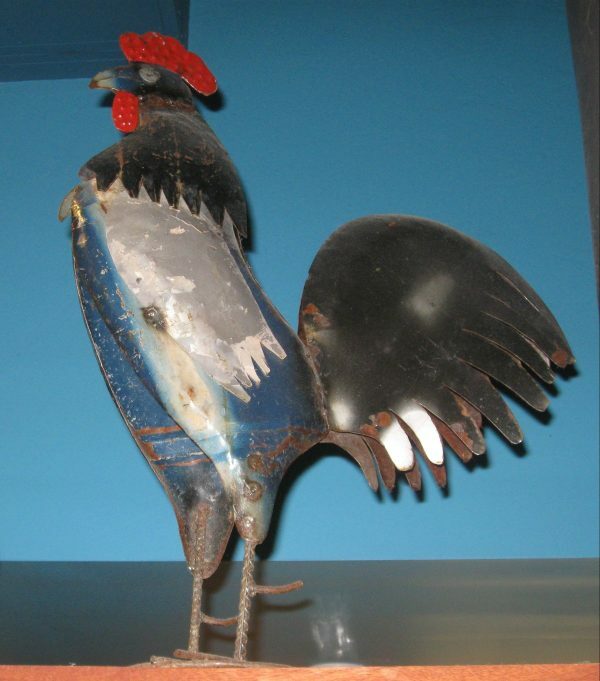 Folk artists have always been good at appropriating found objects and transforming them into fantastic creations. The artists who made these figures are no different. Check out this amazing Mariachi guitarist. The figures are given a painted lacquer finish, which allows them to last for years in the outdoors. Favorite subjects are fish, animals, birds, musicians. I captured photos of some from every category. I hope you enjoy the photos, and my brief comments under each photo. I love this great conjunto accordionist. Its colors and form? Fantastic. It was hard to get a good shot of this amazing lobster. Many of these figures were hanging from the rafters, or displayed on crowded shelves. The cafe’s lighting wasn’t designed to spotlight them; it was designed for people to be able to see what they’re eating. So, I apologize for the photos not being of studio-quality. 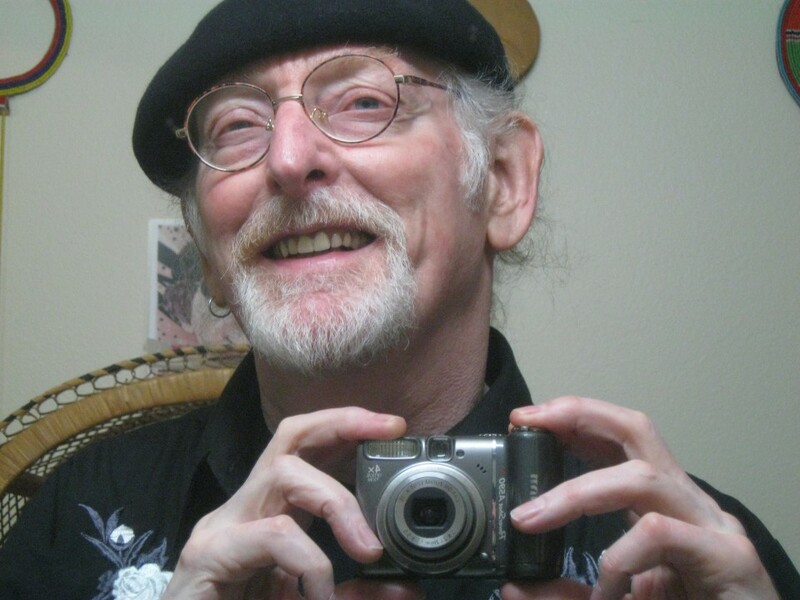 When I shoot photos, out in the real world, I strive to take the best shots I can, on my 10-year-old Canon PowerShot (an antique, by today’s standards). 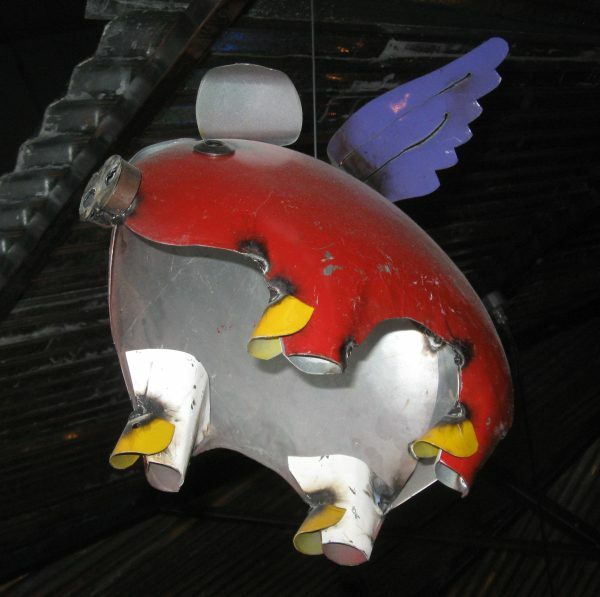 If you’ve seen any of these sculptures in person, you likely saw a rooster or chicken. They seem to be iconic of the genre. I think this bull was my favorite piece in this collection. I love the red; and it just seems like such an icon of Mexico. 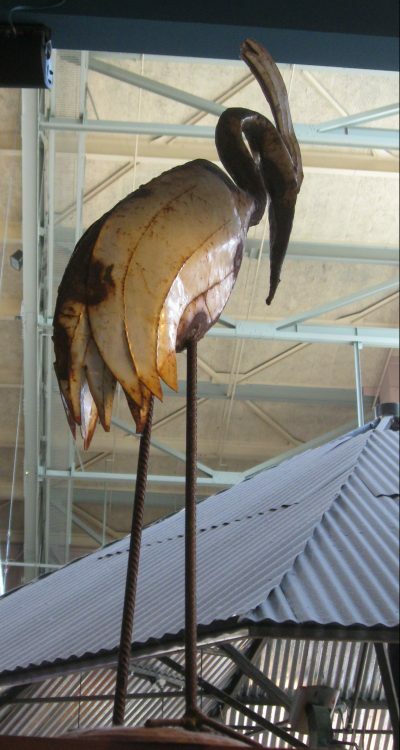 This stork is amazing, on its tall, spindly legs. 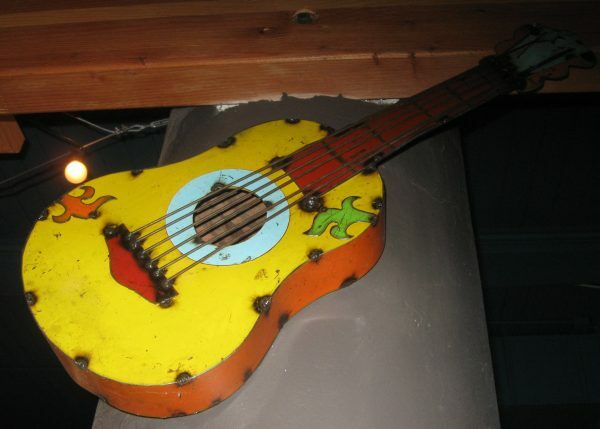 Here is a beautiful yellow-painted guitar, featuring all six strings. I wonder if it’s playable? 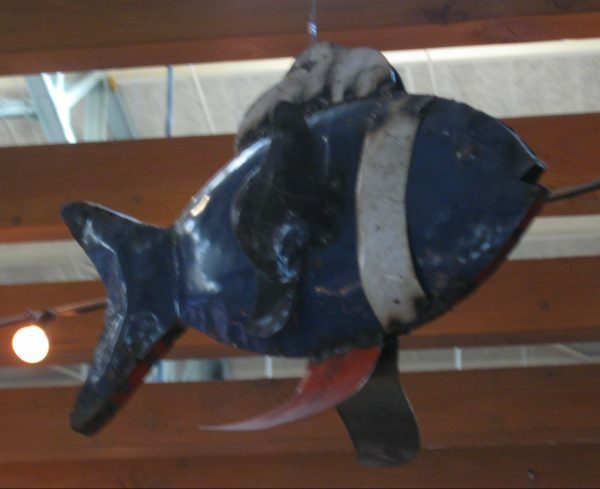 I would love to have taken it off the wall, and strummed out “Vaya Con Dios”, to the amazement of the cafe’s mixologist, who I should say, was watching my every move…. 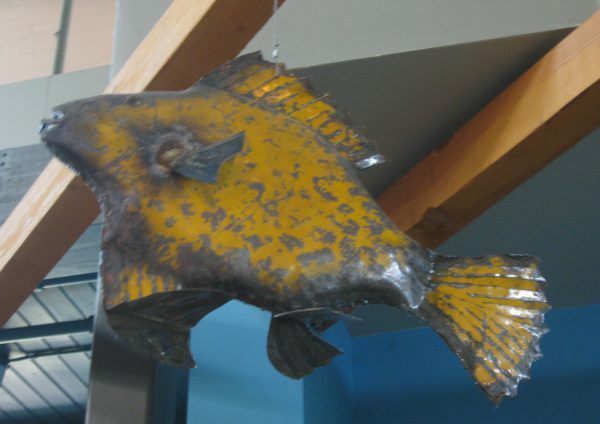 What I wouldn’t give to have a school of these fish, hanging from my hippie pad’s ceiling. Similar yard art can be found, which is unpainted. That’s a little different category of art. The good thing about this art being painted, again, is that it protects it if you decide to place it in the out-of-doors. 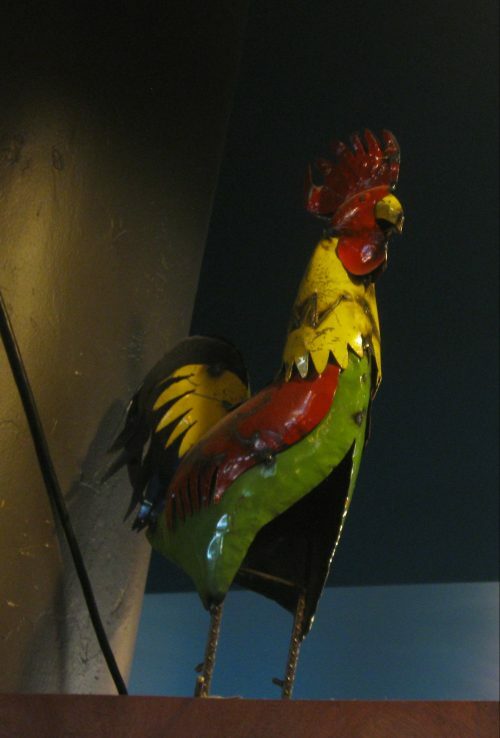 This rooster more closely resembles those unpainted ones. We’re coming to the end of this story; but this big pig was too pretty to leave out. It’s green! One more pig with wings, which will soon be used in a pun. Again, with no artist bios to refer to, with no informative article describing how these sculptures are made, I just had to wing it in creating this post. I hope you’ve learned a little, and enjoyed, a lot! 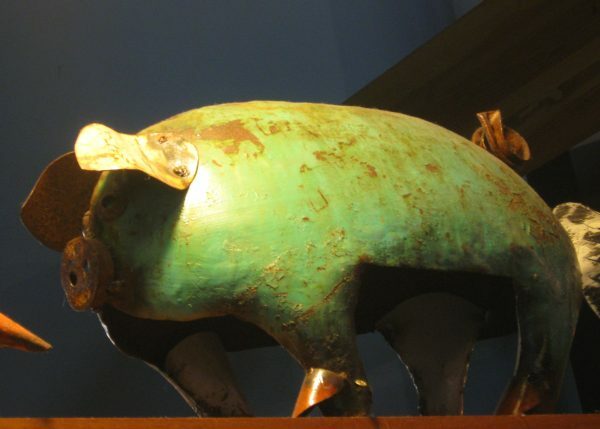 — If you’ve got the dough, perhaps you can add one of these amazing Mexican painted scrap metal sculptures to your collection. I’ll leave you with one last photo, which thanks to its poor placement in the cafe, is rather hard to make out. It’s a photo of two frog Mariachi musicians. Please see my archives, for several other Mexican-related posts. And, Vaya Con Dios, Amigos.